Out Of This World: How Artists Imagine Planets Yet Unseen When astronomers spot a new planet that's too far away to be seen in detail, they work with artists to depict it. Space artists say they have a lot of freedom, but have to be careful, too. 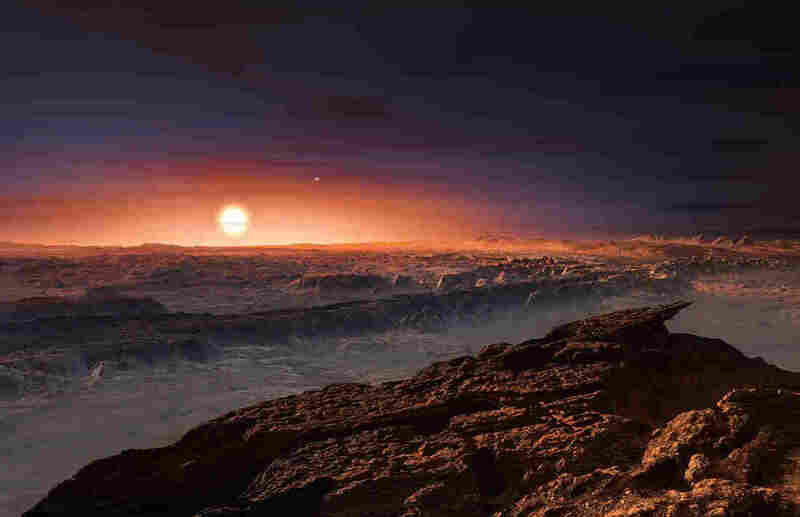 This artist's impression shows a best guess of what the surface of the planet Proxima b might look like, as it orbits the red dwarf star Proxima Centauri, the closest star to our solar system. Maybe Mars was the model? The picture of a craggy canyon, illuminated by a reddish-orange sunset, looked like an image that could have been taken on Mars by one of NASA's rovers. But the alien scene was actually completely made-up. It's part of an ever-increasing gallery of images depicting real planets beyond our solar system that, in fact, no one has ever seen. Astronomers detect these planets by looking for how a planet's gravity tugs on its star, or how a planet blocks a star's light. Over the last two decades, they've used these techniques to detect thousands of planets. Creating popular images to show what the planets might look like has become something of a cottage industry. The artists say this work can drive home the idea that these planets truly exist — but, still, some people worry that the public might get the wrong idea. Four different artists created four different interpretations of Gliese 1214b, a planet 40 light years from Earth that is believed to have a watery atmosphere. "It's tricky with computer graphics," says Ray Villard, news director for the Space Telescope Science Institute. "You can make stuff in such extraordinary detail, people might think it's real. People might think we've actually seen these features — canyons, all kinds of lakes and rivers." "The point of these illustrations is to create excitement, to grab the general public's attention. But there is a danger that many people sometimes do mistake some of these illustrations for real photos," agrees Luis Calçada, an artist with the European Southern Observatory's education and public outreach department. "Many, many astronomers actually do see this danger on this kind of illustration," he says, "because it might create false images on people's minds." It's up to writers and captions to explain what the image really is, Calçada says. "For us, it's quite the biggest compliment if people do confuse our illustrations for a real image," he jokes. 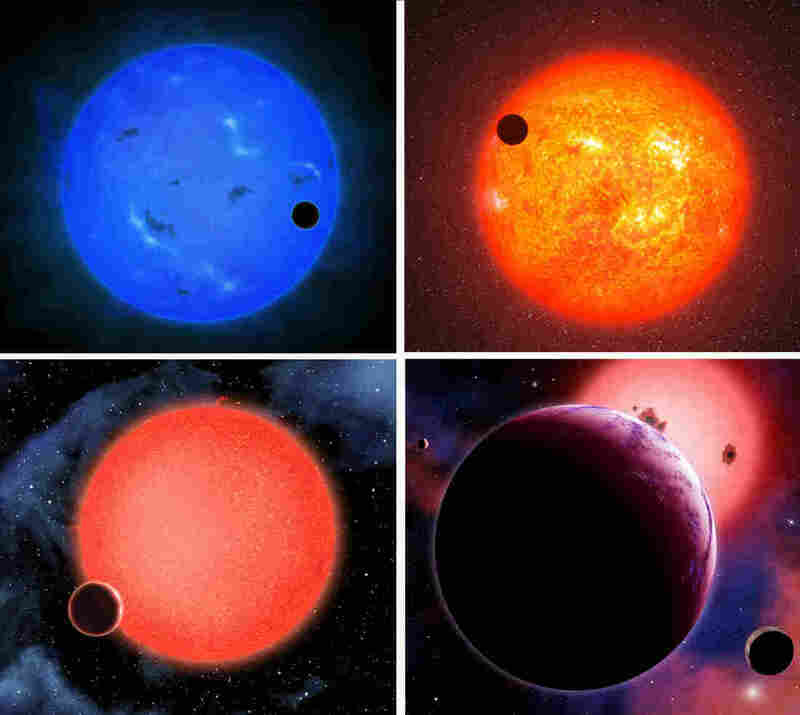 Artists collaborate with scientists, who share what is and isn't known about far-off planets, says Tim Pyle, a graphic artist who used to work for Hollywood and now works at NASA's Spitzer Science Center at Caltech. Just by looking at a star, he says, "we're actually able to extrapolate quite a bit of information about, say, the number of planets that might be around it, their distance from the star, their size." Scientists also usually know a lot about the star itself, and an artist can incorporate all of that into the image. But there are still a lot of details that have to be filled in to create a plausible picture of what the planet might look like — and that can get tricky. "If, you know, we find a planet that potentially has liquid water on its surface," Pyle says, "and, let's say, that's pretty rare. You're going to make sure that whatever your artist's concept is, you're focusing on that water in some way." Depicting water isn't such a simple task. Take a planet called Kepler 186f, for example. 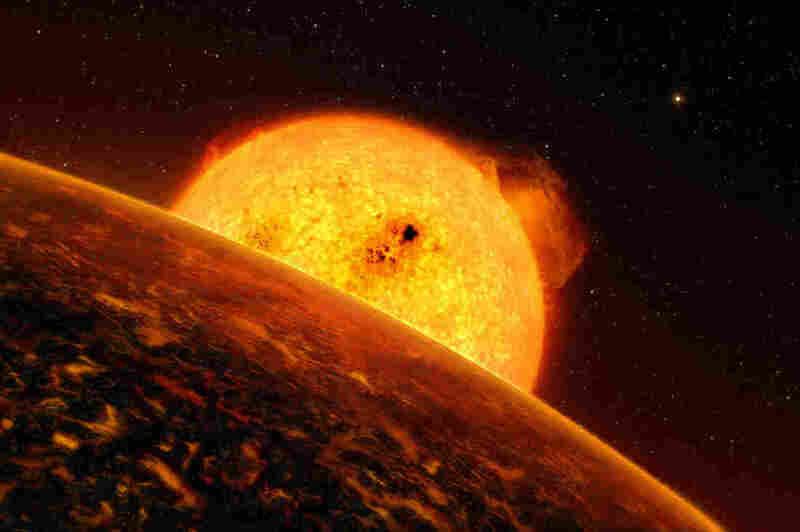 It's a rocky planet that might have liquid water — or maybe not. "We didn't want the general public to see this artist's concept and walk away thinking: 'Wow, they've found another Earth!' " recalls Pyle, who tweaked the color of the water again and again. He and his colleagues finally settled on a kind of muddy brown, instead of blue, so the water wouldn't look too inviting. Then there was the time he illustrated Kepler 452b. Scientists couldn't agree on whether this planet could have water; it might have lost it all in what's called a runaway greenhouse effect. So Pyle created a planet with lots of volcanoes that was just beginning to lose its water. "You could see lakes and rivers that had dried up and left behind salty residue along their shores," says Pyle, "and it was kind of a green, ugly water." Images like this get a lot of press attention — Pyle's vision of 452b appeared on the cover of USA Today, for example. "My mom actually saved a copy," he laughs. In the early days of planet-hunting, scientists mostly spotted giant planets that are hot and gassy. Artists struggled to make each of them look unique. "After you've done 10 'hot Jupiters,' they all sort of start to look the same," says Robert Hurt, an astronomer-turned-artist who works with Pyle. Now that astronomers are finding smaller, potentially rocky planets, things are getting more interesting. Calçada recalls illustrating a rocky world that's so close to its star, it is probably covered in lava. "This was a very exciting one to do," he says. "I quite liked to imagine all these lava features on the surface of the planet. It was not technically challenging, but it was one of the ones that I quite liked." One thing should be taboo when illustrating a planet for a big public announcement by scientists, says Hurt: "We have never put anything indicating the possibility of life, or anything that you'd look at and say, 'Oh yeah, that's definitely a living organism.' "
Even trees or algae would be going too far, in his view. 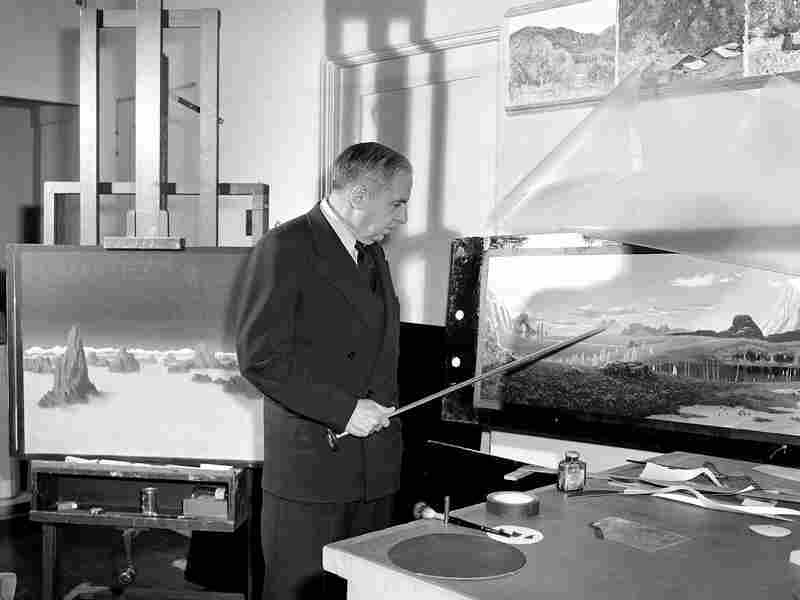 Chesley Bonestell, astronomical artist, points out pyramids on a planet he invented in 1951 for a Hollywood movie. "If you put one tree in that picture, that's the first thing that people are going to see, and that's their take-away," says Hurt. "You really have to be conscious, I think, of what people are going to pull out of that picture — what is going to be the piece of information they will most remember from that. You want to make sure that piece of information isn't something that is completely unknown or wrong." These artists are part of a long tradition; illustrators were creating visions of planets in our own solar system long before any probe ever photographed them. And, in fact, back in the 1960s, famed space artist Chesley Bonestell published a book called Beyond the Solar System that included artwork depicting planets beyond other stars. No such planets had been discovered at that point, but that didn't stop him from envisioning them. Villard says he found this book hugely inspiring when he was a kid. "My favorite one of the planets had a pyramid," Villard says. "So they were implying that somebody might be living there — and they made pyramids, too." Another planet had double shadows, he says, "because there were two stars in the sky. So they would cast different shadows of different colors." Villard still prefers this kind of impressionistic artwork — which is the kind featured in a book he wrote called Infinite Worlds: An Illustrated Voyage to Planets Beyond Our Sun. 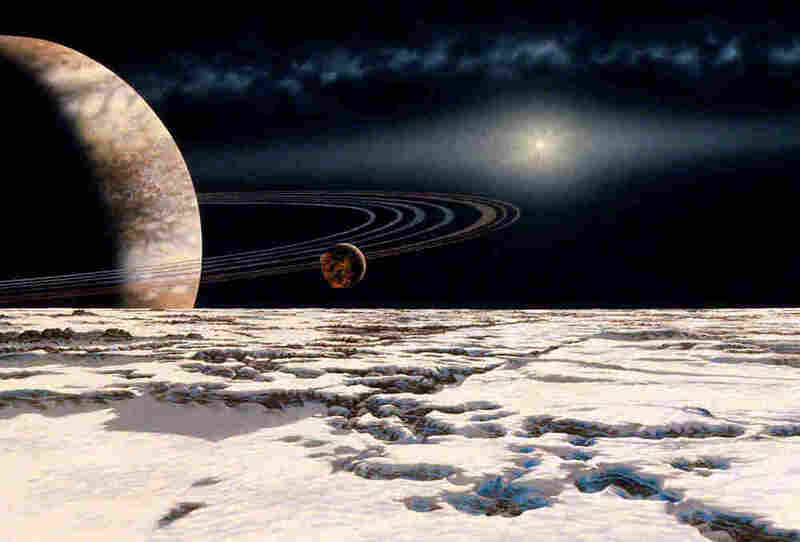 Artist Lynette Cook painted this representation of Epsilon Eridani b and moons, from the book Infinite Worlds. "It can be evocative without showing every little rock and stone and cliff that's on the planet," he says. Still, he doesn't want to knock the computer-generated ones, because he understands the need to excite and inspire the public. And, given the technical challenges, Villard thinks it will be well into the next century before we can take a real photograph of a planet beyond our solar system that comes anywhere close to what a space artist can imagine now.